So we didn't see the actual PlayStation 4 console on stage at Sony's press event tonight, but that doesn't mean we can't know what's inside it. 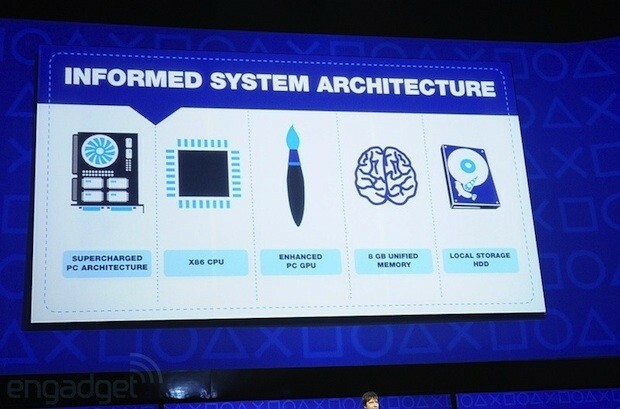 A press release reveals that the PS4's PC-like configuration will include an 8-core 64-bit x86 "Jaguar" CPU built by AMD, with a Radeon GPU comprised of 18 "compute units" capable of cranking out 1.84 TFLOPS to process graphics and more. Its Blu-ray drive -- yes, it will still have one of those -- spins at a brisk 6X (8X for DVDs) and as mentioned on stage, it packs 8GB of unified GDDR5 RAM capable of 176GB/sec of bandwidth. 802.11n WiFi, USB 3.0, Bluetooth 2.1, HDMI, optical out and even a legacy analog AV out make up the inputs and outputs, although the potential amounts of storage are still unspecified. Also mentioned are the new software features, which include long-awaited additions like cross-game chat, and PSN Sony Entertainment Network accounts can now connect to Facebook. Other details we've already heard plenty about, like its instant-on "suspend mode", preloading of content, cloud gaming and shared game experiences. There are still many unknowns about Sony's next game console, get filled in on the facts as they are after the break.